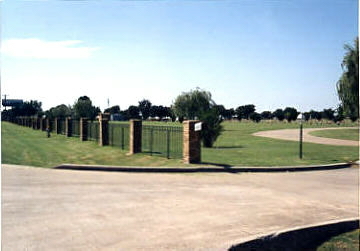 The entrance to this cemetery is on the west access road of US 75 and is highly visible from the highway. The front of the cemetery has brick columns separating panels of an iron-bar fence. The entrance has brick walls with the name Ridgeview Memorial on them. The entrance also has an iron-bar double gate. There is also an entrance from West Ridgeview Drive. The cemetery covers about 10 acres of land and is fenced. 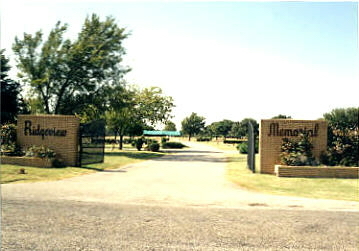 It is the newest cemetery in Collin County, started around 1965. The cemetery uses horizontal markers, or plaques, only and is a perpetual care cemetery. It is privately owned by the Turrentine - Jackson - Morrow Funeral Home and is separate from the funeral home. I have heard that Allen has plans to widen Ridgeview Drive to 4 lanes. At present, Ridgeview Drive does not go east and is a one-lane dirt road going west down the north side of the cemetery. The Stimson Cemetery was west of Ridgeview Memorial, across CR 196 in the middle of a field. The stones for it have been relocated to the Abston Cemetery and the graveyard plowed under. The bodies are still there. The remains from the Gray Family Cemetery in Allen were moved here in the 1980's.